Divorce—Desertion—A husband does not have a right to insist that his wife who is working and looking after their children? give up her job and reside at a particular place. Comments Off on Divorce—Desertion—A husband does not have a right to insist that his wife who is working and looking after their children? give up her job and reside at a particular place. Divorce -Cruelty—Filing of complaint—Seeking recourse to a legal remedy available to a spouse cannot be constituted to be an act of cruelty. Comments Off on Divorce -Cruelty—Filing of complaint—Seeking recourse to a legal remedy available to a spouse cannot be constituted to be an act of cruelty. 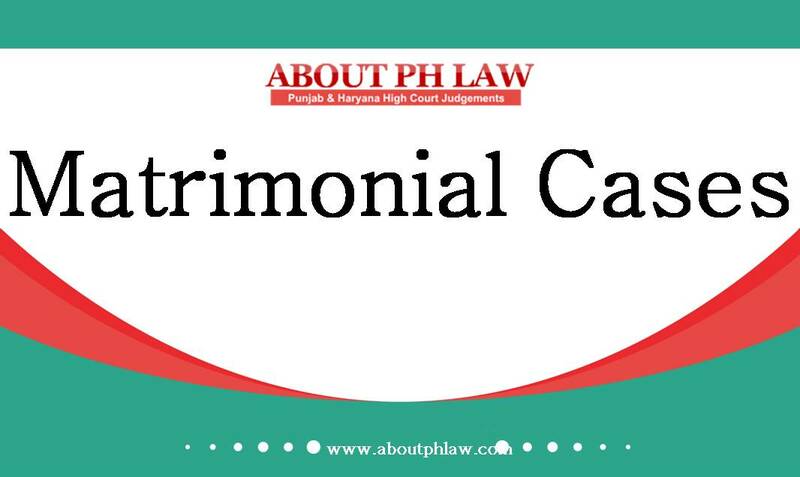 Divorce–Ex-parte Divorce—Divorce proceedings under the Hindu Marriage Act, 1955 are not trial proceedings in a suit where, as per the Code of Civil Procedure, trial Court is bound to frame issues. Comments Off on Divorce–Ex-parte Divorce—Divorce proceedings under the Hindu Marriage Act, 1955 are not trial proceedings in a suit where, as per the Code of Civil Procedure, trial Court is bound to frame issues. Divorce—Cruelty—Use of liquor on some occasion cannot be held to be a continuing misconduct on the part of the husband. Comments Off on Divorce—Cruelty—Use of liquor on some occasion cannot be held to be a continuing misconduct on the part of the husband. Divorce—Long Separation between the husband and wife can certainly, be taken as a weighty circumstance. Divorce—Acquittal in Criminal Case—Husband can seek seeking dissolution of marriage on account of having been acquitted. Comments Off on Divorce—Long Separation between the husband and wife can certainly, be taken as a weighty circumstance. Divorce—Acquittal in Criminal Case—Husband can seek seeking dissolution of marriage on account of having been acquitted. Divorce—False Complaint by wife u/s 498-A IPC and S.3&S.4 Dowry Act-Husband entitled to divorce on ground of mental cruelty. Comments Off on Divorce—False Complaint by wife u/s 498-A IPC and S.3&S.4 Dowry Act-Husband entitled to divorce on ground of mental cruelty. Divorce—Statute itself mandatorily requires the disposal of the divorce petition, preferably within a period of six months. Comments Off on Divorce—Statute itself mandatorily requires the disposal of the divorce petition, preferably within a period of six months.